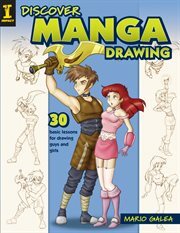 The item Discover manga drawing : 30 easy lessons for drawing guys and girls, Mario Galea, (ebook) represents a specific, individual, material embodiment of a distinct intellectual or artistic creation found in Charlotte Mecklenburg Library. Discover the secrets to drawing manga! You can draw manga! And you'll have fun doing it as you create dozens of guys and girls in a variety of costumes. The easy lessons in this book make drawing in the world's most popular style as easy as picking up a pencil. Start with the basics of drawing heads and bodies, then learn ways to customize each character, from the looks on their faces to the clothes they're wearing. Make your people old or young, happy or angry, sweet or sinister. Hundreds of illustrations and 30+ step-by-step demos show you how to: Give your people feeling with facial expressions Bring them to life with dynamic action poses Personalize them with hairstyles, clothes, weapons and props Pull it all together to create popular character types including bishoujo (beautiful girls loved by all) and bad boys. Dress them up as space samurai, sorceresses, spies, skateboarders and more. Before long, your imagination will kick in and you'll be drawing cool, cute and 100 percent original characters of your own creation. Excited yet? You should be - you're about to draw some real manga!